The City Council authorized using eminent domain to take over the Dominick's in South Shore that has been vacant for a year. HYDE PARK — The city can now use eminent domain to take over the shuttered Dominick’s in South Shore after getting City Council’s OK on Wednesday. 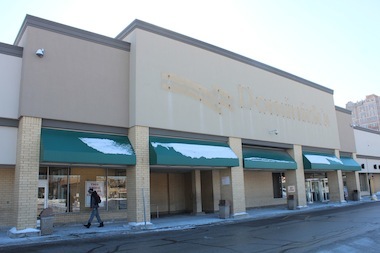 The Dominick’s at 2101 E. 71st St. has been vacant since December 2013 and is the only store still empty nearly a year after the grocery chained shuttered 15 locations. “Residents in South Shore have waited too long for an owner who is not even local to bring a much-needed grocery store back to this area,” said Ald. Leslie Hairston (5th), who has pushed eminent domain as an option since October. The ordinance passed Wednesday would allow the city to begin the eminent domain process to acquire all of 113,000-square-foot Jeffery Plaza, where Dominick’s was the anchor tenant. The shopping center’s owner, Shervin Mateen of Cannon Commercial, vowed in October to fight any move by the city to take the shopping center. In October, Mateen said he was close to signing a deal with Pueblo Supermarkets of Puerto Rico and the U.S. Virgin Islands to move into the space. A representative for Mateen was not immediately available to comment. Hairston has said she was not pleased with Mateen’s choice to pursue Pueblo as a tenant because of a 2010 accusation that Pueblo stole $1.3 million worth of electricity at four of the Virgin Island locations. The company pleaded no contest, paid a $12,000 fine and agreed to provide additional community services, according to the Virgin Island Daily News. Mayor Rahm Emanuel has continued to back the use of eminent domain despite Mateen’s claims he has found a tenant.